A Brooklyn attorney has filed a complaint against New York City Council Speaker Christine Quinn over travel reimbursements she accepted from an LGBT political action committee while raising funds for her mayoral campaign. The Wall Street Journal on Thursday reported that Garfield Heslop filed a complaint with the New York City Campaign Finance Board on June 24 asking it to investigate Quinn over more than $20,000 in contributions her campaign received from donors in Houston, San Diego and Chicago after she attended Gay & Lesbian Victory Fund events in the three cities in 2011 and 2012. The newspaper reported last month the Victory Fund paid Quinn to travel to the three cities to attend their fundraisers. 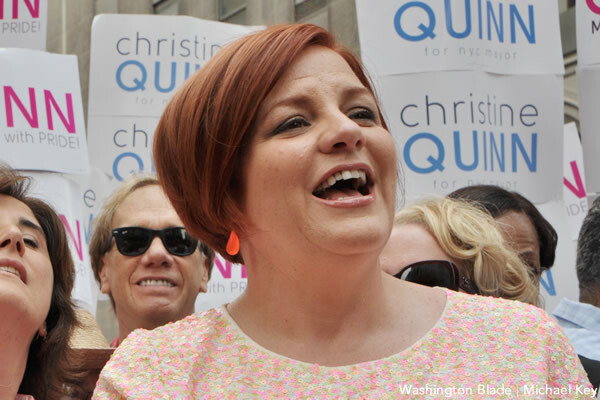 Quinn, who hopes to become New York City’s first gay and female mayor, spoke at the Victory Fund’s annual National Champagne Brunch in D.C. in April alongside U.S. Sen. Tammy Baldwin (D-Wis.) and Pennsylvania state Rep. Brian Sims. The New York City Conflicts of Interest Board opined on May 5, 2011; Nov. 21, 2011 and Oct. 18, 2012 that the Victory Fund could reimburse Quinn for travel costs to their events because she attended them in her official capacity as an openly gay government official. The Victory Fund declined comment. Quinn spokesperson Mike Morey defended the campaign’s actions. New York City campaign finance records indicate the Victory Fund has contributed $165,078 to Quinn’s mayoral bid as of May 15. Edith Windsor, the Manhattan widow who successfully challenged the Defense of Marriage Act before the U.S. Supreme Court, is among the prominent LGBT New Yorkers who have endorsed Quinn to succeed Mayor Michael Bloomberg in Gracie Mansion. Long-time LGBT rights advocate Allen Roskoff, who co-founded the Jim Owles Liberal Democratic Club, are among Quinn’s most vocal opponents. Quinn’s campaign has raised $7,174,177 and spent $1,342,502 as of the same date. Former Congressman Anthony Weiner, who declared his candidacy in May, reported $5,139,175 — which includes $4.5 million left over from his 2009 mayoral bid — in his campaign account and spent $869,109 as of May 15. Republican Joe Lhota, who is the former chair of New York City’s Metropolitan Transportation Authority, reported his campaign had raised $1,283,793 and spent $449,089 as of May 15. The Wall Street Journal/NBC New York/Marist Poll released on June 26 shows Weiner leads Quinn among registered New York City Democrats by a 25-20 percent margin. A Quinnipiac University survey released on the same day found Quinn ahead of Weiner by a 19-17 percent margin. Former New York City Comptroller William Thompson came in third among Democratic voters in the five boroughs with 16 percent. The New York City primary will take place on September 10.